Chemical peels are a great way to bring a luminecent glow to tired or pigmented skin. With our qualified staff to administer the most appropriate solution, a chemical peel can give you a healthier and younger appearance. Our peels include Obagi Blue Peels, Obagi Blue Peel radiance and NeoStrata peels. Blue Peel radiance is the perfect choice for an instant improvement for the skin. This is a superficial exfoliation that works beyond the standard cosmetic cream you can buy at the chemist. 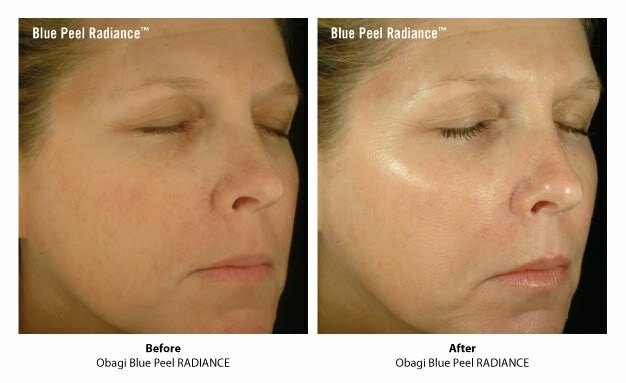 The Obagi Blue Peel helps to combat many skin concerns including photodamage, pigmentation and skin texture. We recommend 4 – 6 (1 per week) of the Obagi for best results. Contact us for a free consultation and discover the benefits of an Obagi Blue Peel. A treatment that works for wrinkles, acne scars, sun damage and uneven pigmentation. At our Finchley Clinic we have the very best medically trained staff to administer the treatment so you can rest assured you are in the best hands. Blue Peel leaves a blue hue on the face that allows the depth of penetration to be assessed. The entire treatment application takes only 30 minutes and the Blue Peel then sets about working on the skin. Over the following 2-3 days your skin will begin to peel and continue to shed over the following week. You will quickly see a brighter, clearer skin and following the months after treatment will glow with a renewed vigour. 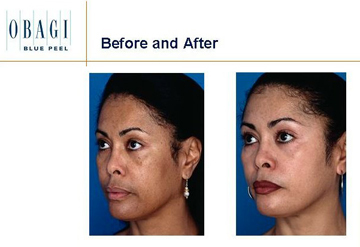 Obagi Blue Peel can be administered to the neck, chest, hands, back, legs and many other body parts. I Visited Finchley Clinic with a deep frown line I really didn’t like. After speaking with Dr Khiroya I opted for a Dermal Filler Treatment & Botox. The results were amazing. Very professional staff and extremely skilled Dr, I would recommend their treatments to anyone. I feel younger & more confident. I have visited Finchley Cosmetic Clinic many times. Dr Baba has suggested the best combination of treatments & I have been so pleased with the results. My Botox, Fillers and a vampire facial has made me look younger and feel great! I had lip augmentation done yesterday at the Finchley Clinic, using the Juvederm. I had to wait a little for the procedure as a lot of clients turned up at the same time, but we were made aware of the delay straight away, which was nice. The procedure and consultations were carried out by a doctor. The procedure itself was very quick. I am extremely happy with the results and will be returning to this clinic to get my lips done again. The doctor has also recommended some other procedures available that would benefit some scarring that I have. I will be booking those in the near future as well. The reception woman was very friendly and informative. Also Dr Baba is very good, I am very happy with what he has done. Also the other doctor next to him was very calming and reassuring throughout the procedure. Amazing service, very professional, great prices. The customer service made me fell very relaxed and I was talked through everything. In my consultation I was recommended what was suitable for me and they would honestly say if I didn’t need certain procedures. I was happy as I don’t like being talked into paying for things I dont need. I definitely will be coming back. Amazing people. Both doctors and receptionist were helpful and comforting will definitely do it again. Happy with my results smile emoticon. Amazing service, the doctors and staff were very professional. The results were great already left my next appointment!